DO NOT USE AS A SOLE SOURCE OF NUTRITION FOR WEIGHT LOSS OR MAINTENANCE. KEEP OUT OF REACH OF CHILDREN. Micellar Casein, Natural And Artificial Flavors, Inulin, Malic Acid, Lecithin, Gum Blend (Cellulose Gum, Xanthan Gum, Carrageenan), Sucralose, Aminogen®, FD&C Blue #2, FD&C Red #40. Add on heaping scoop of Gold Standard 100% Casein™ to a shaker cup filled with 10-12 oz of your preferred beverage. Cover and shake for 25-30 seconds. Take Gold Standard 100% Casein™ immediately before bed and in between meals when delayed protein delivery is desired. You may drink Gold Standard 100% Whey™ or Pro Complex® proteins before and immediately after workouts for a rapid shot of amino acids. Micellar Casein, Cocoa (Processed with Alkali), Natural and Artificial Flavors, Polydextrose. Contains 2% or Less of: Cookie Bits (Enriched Flour [Wheat Flour, Niacin, Reduced Iron, Thiamine Mononitrate, Riboflavin, Folic Acid], Sugar, Palm and Palm Kernel Oil Blend, Cocoa [Processed with Alkali], High Fructose Corn Syrup, Corn Flour, Salt, Dextrose, Sodium Bicarbonate, and Soy Lecithin), Salt, Gum Blend (Cellulose Gum, Xanthan Gum, Carrageenan), Lecithin, Acesulfame Potassium, Sucralose, Aminogen®. Using a shaker cup is the easiest and most convenient way to mix up a consistently great casein shake every time. Just add one heaping scoop of Gold Standard 100% Casein™ to a shaker cup filled with 10-12 oz of your preferred beverage. Cover and shake for 25-30 seconds. Tip: Adjust the flavor and texture of your Gold Standard 100% Casein™ shake by varying the amount of liquid you use to prepare it. For a bolder flavor with a slightly thicker body and more sweetness, mix one scoop with 8-10 oz of water, milk or your favorite beverage. For a thinner, milder tasting, less sweet shake, use 12-14 oz of liquid. Blender: Add one heaping scoop of Gold Standard 100% Casein™ to a blender filled with 10-12 oz of water, milk, or your favorite beverage. Blend for 20-30 seconds. Then add 3-4 ice cubes and blend for an additional 30 seconds. Shake Up Your Shake: By adding fresh or frozen fruits, peanut butter, flaxseed oil, coconut and other ingredients, you can make an even more delicious shake. Stack Your Shake: Customize your Gold Standard 10% Casein shake by adding recovery products like creatine, glutamine and BCAA powders. Spoon Stirred: If you forgot your shaker cup or don't have time to get out the blender, you can just add one heaping scoop of Gold Standard 100% Casein™ to a glass filled with 10-12 oz of cold water, milk or your favorite beverage. Then mix it up with a spoon for about 30 seconds or until powder is dissolved. Micellar Casein, Cookie Crumbs (Enriched Flour [Wheat Flour, Niacin, Reduced Iron, Thiamine Mononitrate, Riboflavin, Folic Acid], Sugar, Palm And Palm Kernel Oil Blend, Cocoa [Processed With Alkali], High Fructose Corn Syrup, Corn Flour, Salt, Dextrose, Sodium Bicarbonate, Soy Lecithin), Natural And Artificial Flavors, Salt, Lecithin, Gum Blend (Cellulose Gum, Xanthan Gum, Carrageenan), Acesulfame Potassium, Sucralose, Aminogen®. Micellar Casein, Natural And Artificial Flavors, Inulin, Salt, Lecithin, Gum Blend (Cellulose Gum, Xanthan Gum, Carrageenan), Sucralose, Aminogen®, FD&C Yellow #5. Micellar Casein, Natural And Artificial Flavors, Cookie Crumbs (Enriched Flour, [Wheat Flour, Niacin, Reduced Iron, Thiamine Mononitrate, Riboflavin, Folic Acid], Sugar, Palm and Palm Kernel Oil Blend, Cocoa (Processed With Alkali), High Fructose Corn Syrup, Corn Flour, Salt, Dextrose, Sodium Bicarbonate, Soy Lecithin), Mineral Blend (Salt, Potassium Chloride, Sodium Gluconate), Gum Blend (Cellulose Gum, Xanthan Gum, Carrageenan), Lecithin, Sucralose, Acesulfame Potassium, Vanillin, FD&C Yellow #5, FD&C Blue #1. Micellar Casein, Natural And Artificial Flavors, Inulin, Lecithin, Gum Blend (Cellulose Gum, Xanthan Gum, Carrageenan), Malic Acid, Beet Powder, Sucralose, Aminogen®. Micellar Casein, Natural And Artificial Flavors, Cookie Crumbs (Enriched Flour [Wheat Flour, Niacin, Reduced Iron, Thiamine Mononitrate, Riboflavin, Folic Acid], Sugar, Palm And Palm Kernel Oil Blend, Cocoa (Processed With Alkali), High Fructose Corn Syrup, Corn Flour, Salt, Dextrose, Sodium Bicarbonate, Soy Lecithin), Mineral Blend (Salt, Sodium Gluconate, Potassium Chloride), Gum Blend (Cellulose Gum, Xanthan Gum, Carrageenan), Soy Lecithin, Sucralose, Acesulfame Potassium, Vanillin, FD&C Yellow #5, FD&C Blue #1. Micellar Casein, Natural And Artificial Flavors, Polydextrose, Lecithin, Gum Blend (Cellulose Gum, Xanthan Gum, Carrageenan), Salt, Malic Acid, Acesulfame Potassium, Sucralose, Aminogen®, FD&C Yellow #5. Casein is a popular protein supplement for those looking for a product that is digested more slowly and provides an ongoing release of amino acids. And naturally, the industry's top selling protein company, Optimum Nutrition (ON), has a product on the market designed to do just that. Gold Standard 100% Casein is ON's baseline slow-digesting protein product, and a top seller across all nutrition stores worldwide. You might be asking why casein is a great option for supplemental protein. Casein brings all of the benefits of a general protein supplement to the table while also generating several unique benefits of its own. The primary advantage is its slow digestion rate, making casein suitable for consumption before going to sleep or long gaps between meals. The protein congeals when passing through the digestive tract, taking the body more time to break down the thick gel and slowing absorption. Casein is beneficial when dieting. When you're experiencing a caloric deficit, you're at risk of losing muscle mass. One reason this happens is because dieters tend to consume fast-digesting proteins that are absorbed quickly. The entire body utilizes the nutrients as energy, including muscles. By consuming a protein that the body digests so slowly, a constant, moderate supply of amino acids are released over a longer period of time and sent to muscles as a priority. This was demonstrated in a study, resulting in significantly more fat loss, increased strength, and lean mass preservation in subjects undergoing a hypocaloric diet and taking either casein protein or consuming a high protein diet. 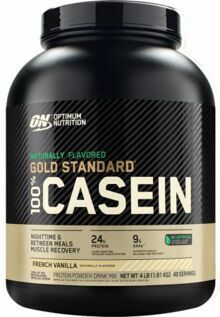 Optimum Nutrition keeps the ingredient list short and simple as the '100% Casein' name suggests. Micellar casein, at the top of the list, is followed by the usual blend of flavoring agents and sweeteners. Their 100% Casein product contains 24g of protein, 3g of carbohydrates, and 1g of fat per serving. This is a significantly higher percentage of calories from protein than many competitors' products, who tend to reduce costs by using lower quality protein sources or use cheap carbohydrates. Perhaps the most noteworthy thing is something most people won't even notice. Optimum Nutrition's 100% Casein increases absorption by adding Aminogen, a patented digestive enzyme blend that has been shown to dramatically increase amino acid bioavailability from protein sources. How to usethey can be too mellow and not bold enough. Take one to two scoops per day, either before bed or during any during long gaps between meals. should talk to your doctor before beginning supplementation, particularly if you are sensitive to dairy. Gold Standard 100% Casein is ON's baseline slow-digesting protein product. It's no coincidence that ON has the best selling protein products on the market. They're well reviewed, offer competitive pricing, great flavors, and excellent customer service. Optimum Nutrition is a wholly-owned subsidiary of the dairy company Glanbia Foods. They own their manufacturing facilities and produce their products under rigorous quality standards. You're more likely to experience inconsistencies with smaller brands that rely on contractual manufactuering plants. Check out our price comparisons below to see where you can get the best deal available on your Optimum Nutrition 100% Casein. We've scoured the web looking for the best possible deals on supplements so you don't have to waste your time comparing prices. Additionally, you can sign up for our newsletter to get updated on all the latest supplement news and deals.